Obviously this is our experience and everyone has a different experience. What I am writing about here, is what I have experienced and learned by trial and error! Hopefully this post helps those wanting to learn more about swim lessons at the local Rota pool. And hopefully I covered everyone's questions -- feel free to message me or comment if you have any more questions! How to Sign Up: Sadly there is no website for the pool -- you must sign up in person at the pool. This seems to be the case for anything we have done in town such as registering for school or getting our certificate of residency paperwork. Everything is done in person and no one seems to have a website! And this means that you need some ability to speak Spanish since most of the people don't speak English. There is one receptionist at the pool that speaks English but I could not tell you when she worked -- so just show up and hope for the best! Everyone we have encountered has been super friendly and helpful, even with my toddler-level Spanish. Cost: Lessons are much cheaper than those in the states or even on base. We pay about 30€ a month for 45 minute lessons twice a week (we paid this same amount when we did parent/tot class, so I am assuming twice a week lessons are all 30€). I do know that if you go three times a week, lessons are a little more, but not much. There is usually a one time registration fee (most we have paid for the whole year is 9€ if you sign up in September). They will prorate the registration fee if you sign up after September. How to Pay: Things are a little complicated when it comes to paying. 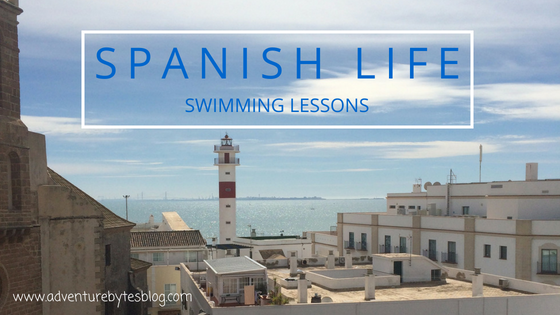 The first six months we did lessons, we were able to pay at the pool each month and it was great... then City Hall took over and you now have to pay using a Spanish bank account or at City Hall each month. The bank account is the easiest way to go as the money just comes straight from your account and that's that. If you don't have a Spanish bank account you have to go to City Hall (sort of -- it's not technically City Hall but right by the main building) and get a receipt/bill between the first and the fifth of each month and then take that receipt/bill to any bank and pay it. UPDATE: this year we have been able to email City Hall (must be in Spanish and include your name and attach a past bill) and they will then email you your bill, then you go to any bank and pay. You still must pay within the time frame or your bill barcode won't work at the bank and you have to start over -- yes, speaking from experience here! Times: During the school year (September to June), lessons for kids are in the evening/after school. Our lessons are from 6:15-7PM (when we did parent/tot class we went from 6:15-6:45PM). I do know some lessons start at 5:30PM and 4:45PM on Tuesdays/Thursday but I am not sure about the other days. During the summer (July and August), there are lessons during the day -- usually starting about 11AM or later and then an option for evening, starting at 7PM or later. From what I have gathered all lessons are 45 minutes except the parent/tot class which is 30 minutes. You can either take lessons Tuesday/Thursdays or Monday/Wednesday/Fridays. There are no lessons on Spanish holidays and the pool is really good about putting up notices a week or two in advance when these days will occur. There is also a Christmas break in December and early January -- usually the same two weeks that kids have off from school (so from right before Christmas to after Three Kings Day in early January). Equipment: I talked briefly about what you need for swim lessons in this post. But you will need a swim cap for anyone going in the water (so yes, if you are doing the parent/tot class, the adult will need a swim cap as well as the kiddo). You will also need specific pool shoes -- these can be flip flops, crocs, whatever -- they just can't be shoes you wear outside of the pool/locker room area. We use the family locker room and some parents use bags or little shoe protection things while in the locker room. But I have seen people get scolded for wearing dirty street shoes into the locker room, so I make sure to always bring my pool shoes too! Everyone heading out on the pool deck does wear pool shoes -- I don't think I have seen anyone go barefoot (kids, parents or even the instructors). The best place to get all the gear is Decathlon which has good quality items for fairly inexpensive. What to Expect: For the most part swim lessons seem to be very similar to those in the states (or at least the ones I used to teach). There is a lot of playing games to learn skills and the kids all seem to be enjoying themselves. Swimmers are separated by age rather than ability as far as I can tell. So Serafina is in a class with all 3 to 5 year olds. The parent/tot class is for all kids under 3 and even though Serafina was ready to move up to the next class, she was not old enough so we had to wait closer to her birthday. The swimmer to instructor ratio is different for each class -- our parent/tot class had one teacher and sometimes up to 15 kiddos. Serafina's class has two teachers who are in the water with her class and I have seen as many as 10 kids in her class. Most of the other age groups seems to have one teacher and they don't always get in the water with them. You will also get a key card (like a credit card) that you will swipe to get through the turnstile to get into the locker rooms/pool area. You card is registered to you and will only allow you to go into the pool on the days/times you have lessons. You will need your card to get in and out so make sure you don't forget/lose it! And obviously, all the lessons are in Spanish :) We have met a few of the instructors and so far none of them speak much English, but they are so kind and helpful it has not been an issue for us at all. Hope all of this helps -- we have absolutely loved our experience with the local pool. 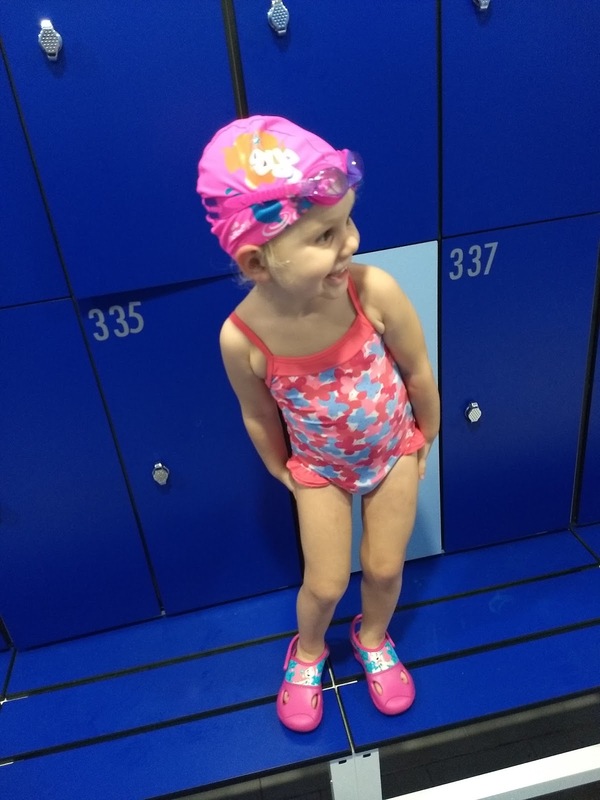 Serafina looks forward to swim lessons and I love how much she has improved! It also allows us to practice Spanish and be that much more immersed in our town!